That perfect meal to make after a cold evenings run, a healthy, heart warming soup. Cut the ginger into chunks and this will give it an amazing flavour and it also offers your body a fantastic dose of antioxidants while soothing and boosting the digestive system at the same time. And…Did you know? Turmeric is an ancient medicine and is known to act as a powerful anti-inflammatory, antioxidant and liver cleanser. This soup is quick and easy to make and freezes brilliantly making it the perfect meal to make in batches and pop in the freezer. Pre-heat the oven to 175°C (347°F/gas mark 4). Bake the sweet potatoes in the oven with their skins on for 1 – 1.5 hours until soft at the centre. Remove from the oven and set aside to cool. While the sweet potato is cooling, add your onions to a pan with the sunflower oil and sweat on a gentle heat with the salt and pepper until they have softened. Next, add the chilli, garlic, ginger and turmeric and continue to cook for a further 3 minutes until it begins to release those delicious smells. If the pan looks like it is getting a little dry, add 1 tablespoon of water at a time to loosen the mixture. Whisk the vegetable bouillon powder into the boiling water and add to the pan. Chop the sweet potatoes in half lengthways and with a spoon, scoop out the flesh from the skin and add it to the pan. Transfer the mixture to a blender and blitz until smooth – alternatively, use a stick blender; I find it eases the dreaded washing up! Once smooth, correct the seasoning if necessary and enjoy! A sprinkling of coriander, chives or both! 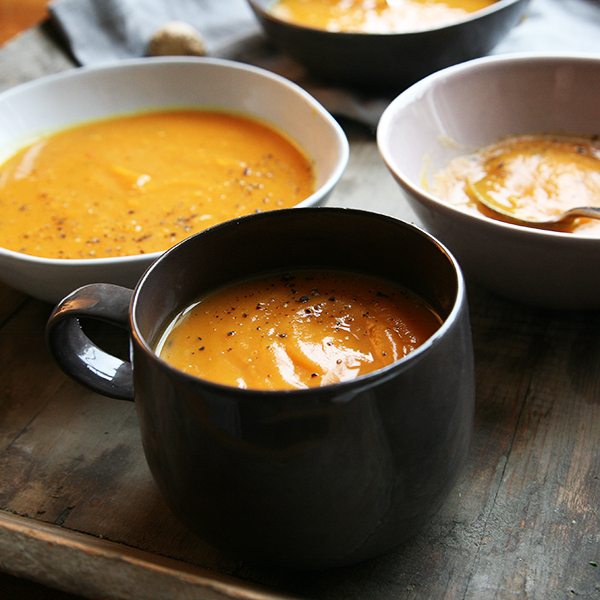 Thank you Rosannagh for this hearty, winter soup recipe. http://www.clovefoodco.com. Rosannagh, the brains behind the new and utterly yummy recipe blog CLOVE food co, is a London based private chef, food stylist and cookery teacher. Having trained as a chef back in 2005, she has been cooking for the last 10 years while developing a sound knowledge of all things nutritious and utterly delicious. Her recipe blog CLOVE food co is all about sharing bright, fresh recipes that are going to do your body the whole world of good!